When medical errors leave you worse off than you were before you sought treatment for your medication condition or illness, it is fully within your right to demand compensation from the doctors and hospital responsible for your injuries. The Springfield medical malpractice attorneys of Rosenfeld Injury Lawyers LLC work on behalf of clients to maximize the value of their cases in order to ensure that they can afford the treatment required to be made whole again. When considering these types of cases, establishing patterns of negligence works in our clients’ favor and we’ve provided the latest information concerning the areas in which Springfield’s local hospitals have failed. Contact the Springfield medical malpractice attorneys at Rosenfeld Injury Lawyers LLC for a Free Review of your legal rights and options. We are ready to serve you and your family. Aside from the State of Illinois, Springfield’s largest employers are its two hospitals and the Southern Illinois University School of Medicine is its ninth largest provider of work. These three institutions alone provide almost 11,000 jobs. This healthcare system serves over 211,000 individuals in Springfield’s metropolitan area, including 117,000 residents living within Springfield’s city limits. The limited options available to patients in such an extended area are a detractor to quality, however. Less competition reduces the need to compete and unlike the greater Chicago area, those living in Springfield’s suburbs are forced to choose between only two available options. When you suspect that the injuries you have suffered are due to medical negligence, defective medical devices or a medical error, Illinois law provides you with the right to bring a lawsuit against the doctor or facility responsible for your injuries. In order to maximize the value of our clients’ cases, our Springfield medical malpractice attorneys assess the value of each case by considering the entire economic impact of the victims’ injuries. The damages we seek may include the following. The cost of revisionary procedures. If you’ve received a defective implant, you suffered internal bleeding due to a surgeon’s error or your injuries resulted in a medical condition which required additional surgical procedures to correct, you are entitled to the cost of each procedure. Your hospitals bills and the cost of continued care. Emergency rooms provide responsive care to life threatening injuries, but at significant cost to the patients. If you required emergency care due to complications related to a medical error, you are entitled to recover compensation in the amount of your hospital bills as well as any additional care that is deemed necessary to your recovery. Lost wages and opportunities. When injuries are so debilitating that they leave you unable to support yourself or your family, it is reasonable to expect compensation for the value of your lost income throughout your physical recovery. In the event that your injuries rendered you completely unable to work again, you may also be entitled to compensation due to lowered quality of life and the loss of potential future income. Pain and suffering. There really can never be a value placed on the hardships and suffering that victims must endure when they’ve been injured due to a doctor’s carelessness, but you may recover some form of compensation for your pain and suffering at a value determined by a jury. Wrongful death. In the event that your loved one died due to medical negligence, you may file a lawsuit for wrongful death and recover damages for loss of consortium and the value of the economic contributions your loved one made to your family as a breadwinner. Springfield’s medical needs are served by two hospitals, which also provide for all of Springfield’s suburbs and outlying towns. The data we have compiled about each hospital can provide a deeper understanding of some of the contributing factors considered in medical malpractice cases. Here is a look at how your local hospitals are performing and where they can make improvements. Memorial Medical Center is a level one trauma center providing emergency pediatric treatment and level two perinatal care. 79% of patients surveyed would highly recommend this facility to their friends and families, but cited issues include concerns over cleanliness, patient education on health matters and a high mortality rate among stroke patients. The facility’s readmission rates speak volumes on the efficacy of its treatment for patients experiencing serious conditions or requiring emergency treatment. Mortality rates are often linked to readmission rates as well as patients are far more likely to die when they are released too quickly. 17.3% of patients admitted with pneumonia, 23.1% of patients suffering congestive heart failure and 17.3% of heart attack patients were readmitted to this facility within thirty days of discharge. Only about 40% of those who were readmitted survived. Illinois’s average stroke fatality rate is 70.96 out of every 1,000 cases whereas Memorial Medical Center’s stroke mortality rate is 96.15 out of 1,000. There are additional concerns over measures taken to prevent and treat blood clots. 11% of the patients who developed blood clots in the hospital were not provided preventative treatment and only 80% of patients undergoing surgical procedures received treatment meant to prevent the formation of clots. Finally, only 54% of patients suffering from blood clots were released with medication and proper care instructions for their blood clots. St. John’s is designated and rated highly as an infant and child friendly hospital. It is also a level one trauma and pediatric critical care center that provides level three perinatal care. St. John’s experiences birth trauma injury and obstetric injury rates that are in line with the state average. Its pediatric care excels in every area assessed and is far ahead of state and national averages. The number of accidental incidents in which patients suffer lacerations and puncture wounds during surgical procedures is twice the state average. 3.43 out of every 1,000 patients were accidentally cut or suffered puncture wounds in unintended areas during operative procedures. Accidentally cutting a patient in the wrong location can result in numerous serious complications and increase the risk of infection following surgery. Finally, only 54% of the patients surveyed felt that they understood their treatment and how to manage their illnesses or conditions upon discharge. This highlights the need for hospital staff to communicate with and provide better information to their patients so that they may avoid readmission due to a worsening of their conditions, injuries or illnesses. Illinois law limits the amount of time you have to file a lawsuit and while the statute of limitations is normally two years, there are other factors which may impact the timeframe you have within to file. Having one of our Springfield medical malpractice attorneys evaluate your case quickly will provide us with ample time to build your case, gather time sensitive evidence and maximize your chance of success prior to the expiration of your statute of limitations. The attorneys at Rosenfeld Injury Lawyers LLC have handled thousands of cases involving medical negligence and have successfully secured the compensation needed for our clients to cover their expenses throughout their physical recovery. 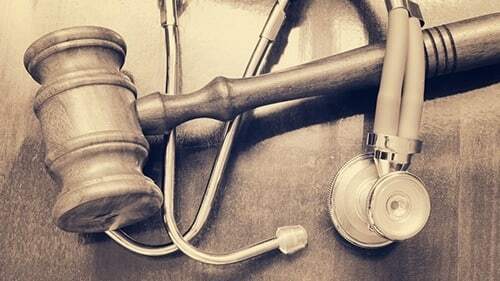 Contact us today to arrange a free consultation with one of our Springfield medical malpractice lawyers so that we can review your case, discuss your legal options and guide you through the steps needed to pursue your claim. If for any reason we are unable to collect compensation on your behalf, our services won’t cost a thing.